2000s is transforming the meaning of art and that of business. What were once marginal practices of networking in underground hacker and artistic contexts have in recent years become a core business for many information technology companies and social media enterprises. In Bazzichelli’s analysis, art intertwines with disruption beyond dialectical oppositions, leading to a discovery of subliminal and distributed strategies, which emerge from within the capitalistic systems, or act within it. In the exhibition and seminar, she involves actors who directly engage with hacktivism, art, civil liberties and social networking exposing contradictions of capitalistic logics and power systems. Such interventions hijack the logic of business itself, appropriating and détourning it by operating disruption. The challenge is to collectively rethink oppositional hacktivist and artistic strategies within the framework of (social) networking, information economy and increasingly invasive corporations and government agencies. The exhibition shows a diverse constellation of networking projects that aims to actualise – and to question – the notion of “networking” itself: Anna Adamolo, Anonymous, Billboard Liberation Front, Burning Man Festival, Cacophony Society, Janez Janša, Janez Janša and Janez Janša, Julian Oliver, Laura Poitras, Les Liens Invisibles, Luther Blissett, Mail Art, Neoism, Peng! Collective, Suicide Club, Telekommunisten, and Trevor Paglen. The Networked Disruption exhibition is based on Bazzichelli’s book Networked Disruption: Rethinking Oppositions in Art, Hacktivism and the Business of Social Networking (DARC Press, The Digital Aesthetics Research Centre of Aarhus University, 2013). Bazzichelli’s hypothesis is that mutual interferences between art, hacktivism and the business of social networking have changed the meaning and contexts of political and technological criticism. Hackers and artists have been active agents in business innovation, while at the same time also undermining business. 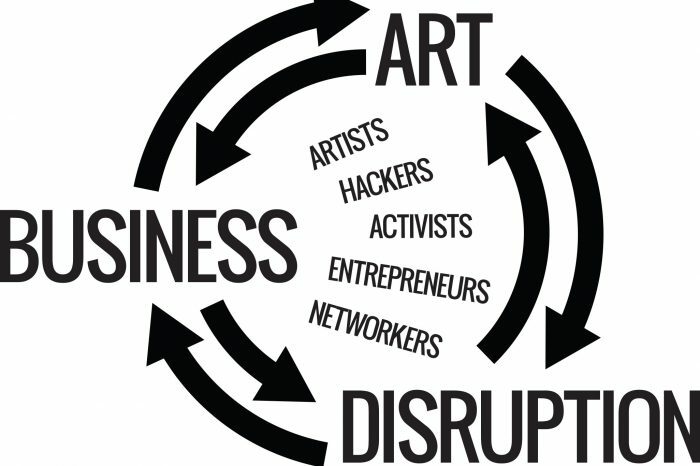 Artists and hackers use disruptive techniques of networking within the framework of social media, opening up a critical perspective towards business to generate unpredictable feedback and unexpected reactions; business enterprises apply disruption as a form of innovation to create new markets and network values, which are often just as unpredictable. Bazzichelli proposes the concept of the Art of Disrupting Business as a form of artistic practice within the business field of information technology. The artworks and collective projects are conceptually and visually interlinked in the exhibition spaces, which constitutes a network of networks. By applying the strategy of “working from within”, some sections of the show are conceptualised in collaboration with people deeply involved in the networks under scrutiny: Vittore Baroni (Mail Art), Florian Cramer (Neoism), Gabriella Coleman (Anonymous), John Law (Suicide Club and Cacophony Society), Andrea Natella (The Luther Blissett Project) and members of the Anna Adamolo network. This choice reflects the perspective that a new methodology of curating a research should open a metaphorical (and physical) space to encourage and provoke feedback loops among theory and practice, and among subjects and objects of analysis. The result is a constellation of networking practices, which aims to actualise – and to question – the notion of “direct participation” itself. In parallel with the group exhibition, the seminar develops the topic of Networked Disruption through five discussion sessions and presentations organised over two days, followed by a collective round table. 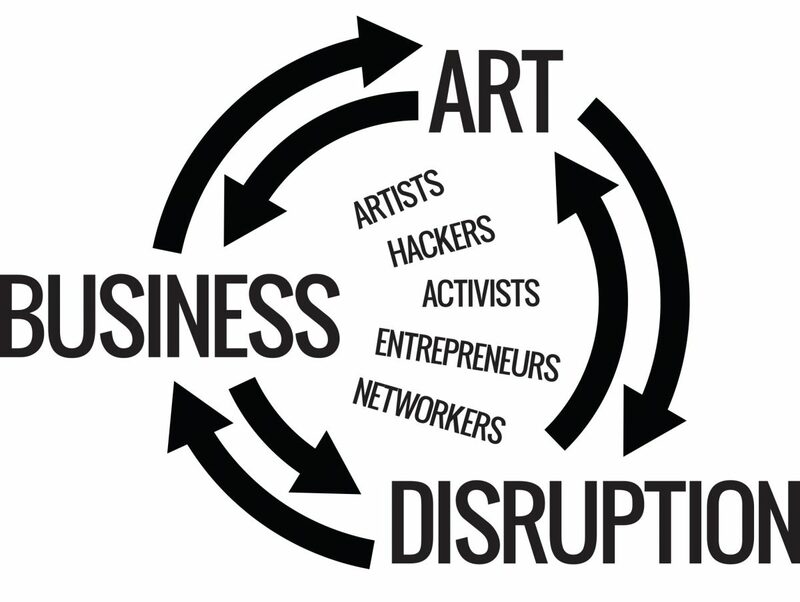 In the last decade, the critical framework of art and hacktivism has shifted from developing strategies of opposition to embarking on the art of disruption. By identifying the emerging contradictions within the current economic and political framework of information technology, this seminar presents a constellation of activist and hacker practices, as well as those of artists, who work on the interferences between networking participation, political criticism and disruptive business innovation. It adopts a historical perspective on the notion of social networking, by connecting together disruptive practices of networked art and hacking in California and Europe. Furthermore, the concept of disruption is applied to the recent debate on geopolitical surveillance after the Edward Snowden’s disclosures, investigating critical practices and new strategies of oppositions that are happening within closed systems. Tatiana Bazzichelli is a curator and researcher, author of the books Networked Disruption (2013), Networking (2008), and co-editor of the book Disrupting Business (2013). She is director of the Disruption Network Lab, an experimental curatorial project on art, hacktivism, and disruption, based in Berlin. She was programme curator at the transmediale festival from 2011 to 2014, initiating the year-round reSource transmedial culture project, and was a Post-Doctoral researcher at the Centre for Digital Cultures, Leuphana University of Lüneburg. Cultura in Slovenia, Imago Sloveniae.